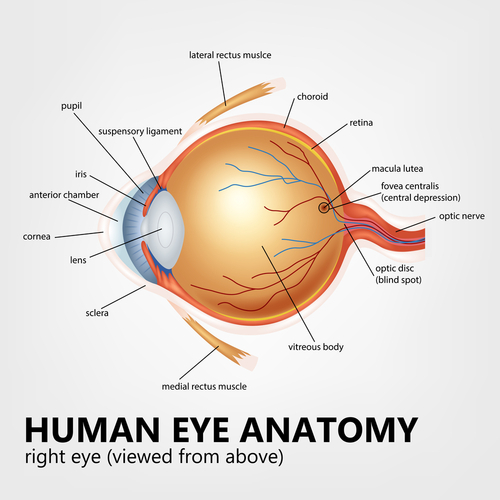 The macula lutea is a tiny, but vital spot in the retina responsible for our central vision. In Latin "macula" means spot and "lutea' means yellow. Indeed on a fundus or picture of the retina it shows up as a yellowish spot. 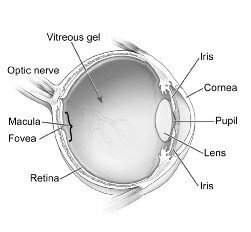 The macula is responsible for our straight ahead or central vision as well as our sharp, detailed vision. Here is a picture of a healthy retina. The macula is the slightly redder spot just right of the center. The brighter, yellowish area is the optic nerve. 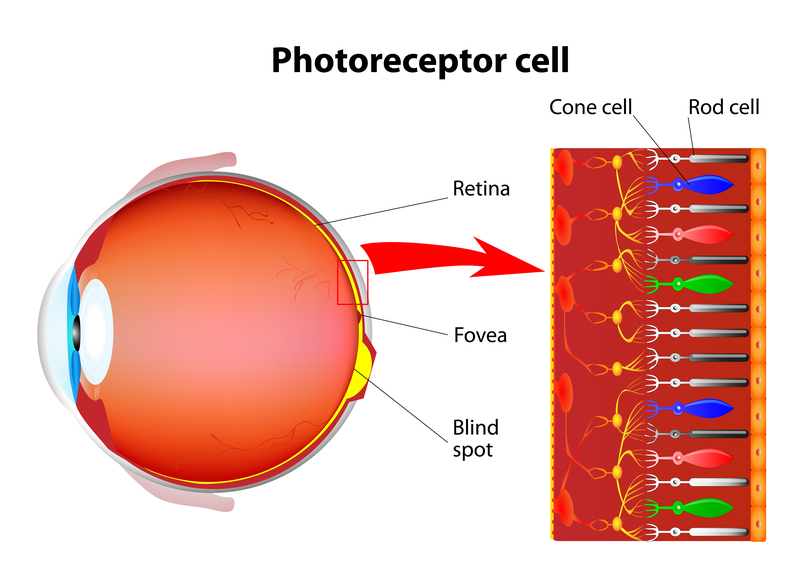 Made up mainly of cone cells (photoreceptor cells responsible for color vision). It does not have rod cells. It has the densest concentration of cones in the eye. Here you can see from this picture where the macula lutea/fovea is located. The fovea is in the center of the macula. The fovea is critical for our vision. It is the part of the eye we use when we are focused on reading a page, looking at a picture, or seeing a face. 4) Photoreceptor Cells are cells that convert light into electrical messages. These messages are sent to the optic nerve which then goes to the brain. As we age, the supporting tissue to the macula are not functioning as well and do not get the needed nutrients and oxygen to these cells. The transport of these nutrients are affected as well as the removal of waste products. When this happens the photoreceptor cells begin to degenerate and/or die which leads to macular degeneration. If the macula degenerates there is a loss of central and detailed vision, making it difficult to read, drive or to recognize faces. Some of the common symptoms of macular degeneration are blurred vision and straight lines appearing wavy. There are earlier symptoms of retinal changes that can be detected by your eye specialist. 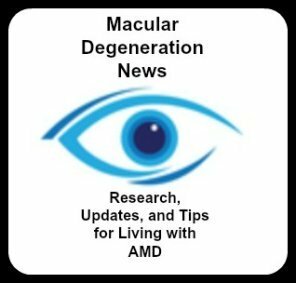 2) Age Related Macular Degeneration (AMD) occurs when the layers supporting this tissue become clogged and inefficient and the photoreceptors in the center of the retina degenerate and die. 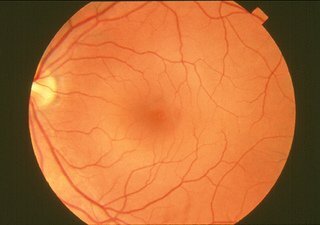 Because this tiny spot is responsible for central, detailed and color vision, you can understand why these functions are lost when a person develops age related macular degeneration.